Bangladesh made a good start in the Bangabandhu SAFF Championship when they defeated Bhutan by 4-1 goals in their opening Group B clash at the Bangabandhu National Stadium on Friday. Bangladesh led the first half 2-1. 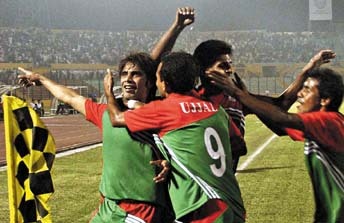 Enamul scored two goals and his teammates Pranotosh, Emili netted one each while Dendap of Bhutan pulled off one. BSS adds: In the day’s inaugural fixture of the competition, Sri Lanka edged past Pakistan by a solitary goal. It would have been a real feast for the hosts if the Bangladesh forwards had utilized their chances. Some nervous defending and lady luck smile in favour of the Bhutanese defence as they did not concede four or five more goals. Midfielder Ujjal curved the fourth corner from the left flank and the dipping ball that was cleared by a Bhutanese defender fell to defender Mishu’s feet at the top of the box. His drop shot took a few deflections before Pranotosh tapped it home from a handshaking distance. The early goal whetted the quest for more goals for Bangladesh as Enamul saw his side volley off a Nasir minus deflect off a defender in the 15th minute. Bangladesh’s perseverance paid off in the 23rd minute when Pranotosh’s gem of a through pass found Enamul with the ball on a platter as a lanky forward made no mistake to blast past the helpless Bhutanese custodian Leki (2-0). Enamul was unlucky as he failed to add the third goal for Bangladesh when his header off an Emily cross outwitted Leki in the air but much to the dismay of Bangladesh supporters it bounced back to the play hitting the woodwork in the 33rd minute. Emily missed an easy chance as he shot straight to the lap of Leki off Enamul’s cross in the 35th minute. Out of blue, Bhutan reduced the margin two minutes from the lemon break when defender Nasir’s clumsy foul on Nawang Dendup prompted referee Srinivashan Suresh to award a penalty. Nawang sent Bangladesh custodian Aminul in the wrong way from the spot to hit the back of the net (1-2). Bangladesh came back strong after the resumption and the second half was the story of near misses as Bangladesh looked relaxed on a two-goal cushion. Enamul, who looked the best among the Bangladesh forwards, got his second as he made no mistake to beat Bhutanese goalie with a neat header in the 53rd minute (3-1). Overlapping Rajani had the opportunity to make it 4-1 but shot over from an advantageous position. Emily’s perseverance paid off as he finally found the net in the 72nd minute as Enamul doing the spadework (4-1).